Detail of façade; click to enlarge. Additional renderings appear below. I wanted to point out a few design elements that I find most interesting. The mixture of building materials will likely include brick, metal, wood, stucco, glass, etc. This adds interest and texture to the buildings. 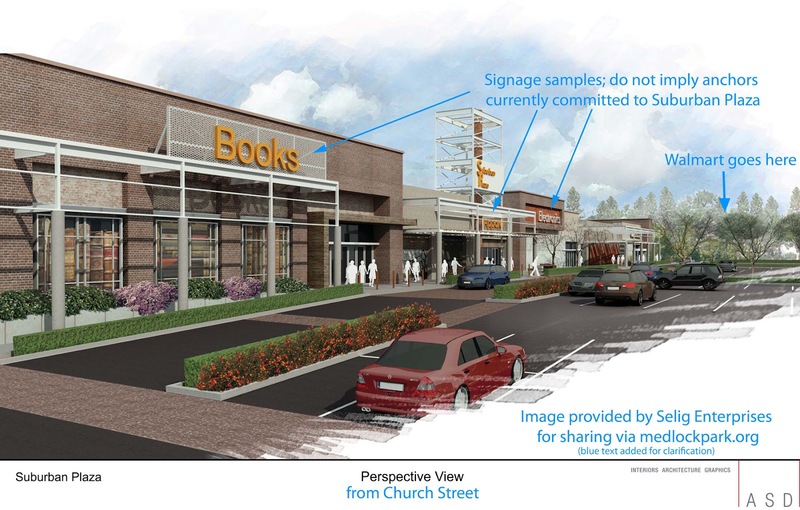 There is an attempt to differentiate the storefronts with variation in the signage and adding facades so that the building will not longer appear flat and one-dimensional. The new design removes the existing canopy over the front of the building, allowing additional greenery and landscaping to be added to the storefronts and parking area. Walmart is responsible for the design of their building. Once Selig has selected the final material/color palate for the redevelopment, Walmart will incorporate similar elements to create a cohesive look for the shopping center. Selig has also hired Bilson and Associates to complete the landscaped design and they will continue to work with Perkins and Will on the site layout and design. Permitting/Schedule/Process – Walmart submitted plans for their land disturbance permit in early June. They are currently addressing county comments and anticipate submitting revised drawings by the end of this month. Demolition and renovation of the existing shopping center remains on schedule to begin in the first half of 2013. After permits are secured and necessary tenant leases are terminated, Selig Enterprises, Inc., as master developer of the project, will be responsible for all building demolition (including the site of the new Walmart) in preparation for new construction. This includes approximately 80,000 sf of building. Selig, owner of over 250 commercial buildings in the metro Atlanta area, has a reputation for following proper protocol and regulated procedures during demolition, material handling and remediation and we expect nothing different on this project. 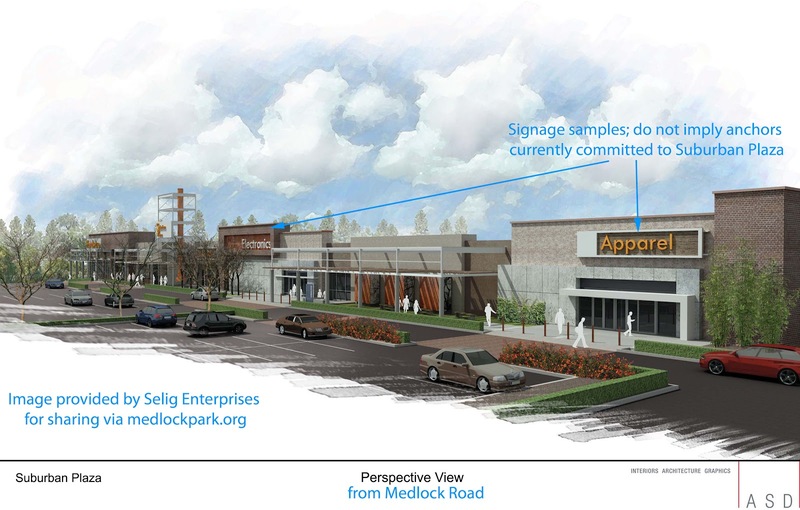 Leasing – Selig is in continuing talks with several national retailers and local businesses who are interested in locating at the redeveloped Suburban Plaza. They plan to announce the new tenants in the coming weeks. 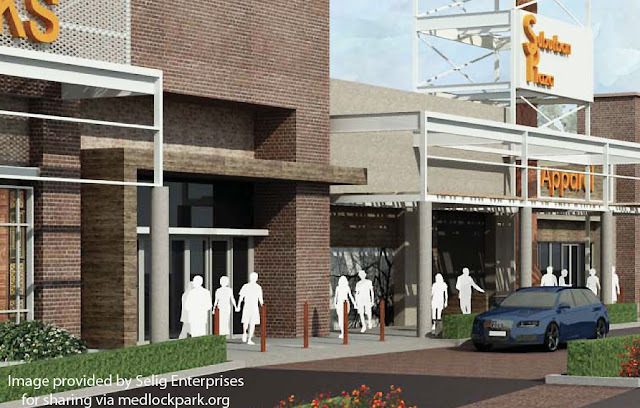 Please continue to check the website for the most recent information on the Suburban Plaza redevelopment.